Cockroaches are continuously evolving, so proactive control solutions can make the difference in turning new accounts into loyal customers. Adding to its high-performing portfolio of solutions for cockroach control, Syngenta has launched Advion® Evolution and Optigard® Cockroach Gel Baits to offer customers enhanced bait matrices and differentiated active ingredients (a.i.s) to tackle tough cockroach populations. Advion Evolution contains an enhanced bait matrix that is highly attractive to cockroaches, which results in increased feeding and speed of control. Featuring the same active ingredient in Advion Cockroach gel bait, indoxacarb, helps Advion Evolution provide exceptional control of a variety of cockroach species. Additionally, this bait will not run or slide on vertical surfaces, stain or produce odor. Optigard Cockroach features emamectin benzoate, a unique a.i. that affects cockroaches at two different target sites. This helps provide another critical tool to effectively control cockroaches, all while following good resistance management practices. Its unique a.i. 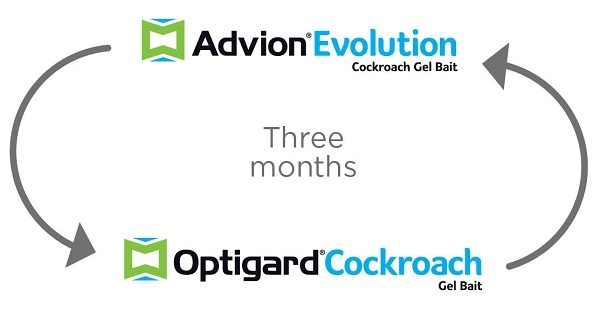 and formulation also make it an ideal rotational partner for Advion Evolution as part of a cockroach control strategy. The average life cycle of a German cockroach is three months. It is recommended that products be rotated every three months to match this cycle. With these forward-looking cockroach control innovations, Advion Evolution and Optigard Cockroach can help PMPs stay ahead of cockroaches today and tomorrow. For more information, visit www.SyngentaPMP.com/CockroachSolutions. ©2017 Syngenta. Important: Always read and follow label instructions. Some products may not be registered for sale or use in all states or counties and/or may have state-specific use requirements. Please check with your local extension service to ensure registration and proper use. Advion®, For Life Uninterrupted™, Optigard® and the Syngenta logo are trademarks of a Syngenta Group Company. Syngenta Customer Center: 1-866-SYNGENT(A)(796-4368).